Advanced and innovative technology: the determining factor in the development of outstanding automobiles and the cornerstone of BMW's quest for automotive excellence. BMW’s singular desire for automotive excellence and the production of exciting alternatives in the up-scale market dates back to its classic entries of the 1930’s. From the beginning, BMW’s commitment was to the manufacture of automobiles noted for extraordinary agility, remarkable handling and efficient design. The philosophy of exceptional performance achieved through balance, not excess, has been at the heart of BMW’s rise to its position, today, as the pre-eminent manufacturer of exclusive performance automobiles for the driving enthusiast. BMW stands proud of its reputation for understated luxury and engineering excellence. It is a pride that runs deep — to the very heart of BMW. And at the heart of BMW, there is motor sport. BMW has always been deeply involved in motor sport; this dedication has stamped a distinct and lasting mark on all BMW automobiles. The BMW name is synonymous with performance both on the highway and the racetrack. Drivers of production BMWs have enjoyed the exhilarating benefits of intensive motor sport competition for over 50 years. No less than 31 World and European championships, 115 national championships and a large number of individual victories in all kinds of racing categories and contests bear witness to BMW’s extraordinary success in motor racing. The same story applies to BMW motorcycles with innumerable wins scored by BMW drivers — 166 national championships and no less than 37 World and European championships clearly prove the successful tradition of BMW motorcycle racing. While BMW’s past accomplishments represent an extraordinary statement of technological advancement — that, to BMW, is still history. BMW works in the future — to deliver the finest automobiles possible — today. BMW’s present automotive activities offer a fascinating profile of the application of technology on the threshold of tomorrow. Just consider the first computer-controlled engine introduced by BMW in 1979, and the spectacular success of the BMW Formula 1 power unit which, only in its second year of racing, helped Nelson Piquet win the 1983 Grand Prix World Championship. The high performance automobiles and motorcycles bearing the BMW symbol enjoy an extraordinary reputation for excellence — an excellence defined by BMW’s unique character and uncompromising quality. So it is that the joy of owning a BMW evidences itself immediately whether behind the wheel or the handlebars. This joy represents the product of an organizational spirit characterized by a common desire for achievement, singular contribution by outstanding individuals and a universal love of competition. This philosophy has produced exceptional results. During the last 15 years, BMW has become the most successful manufacturer of exclusive automobiles. Achieving this kind of success demands more than a first-class range of models or extraordinary talent. It calls for consumers who appreciate automobiles tailor-made to satisfy the true driving enthusiast. And that consumer has come to be distinguished as the BMW owner. Just like the automobiles and motorcycles built by BMW, BMW drivers are distinguished by their individual nature. Precise and performance- oriented, BMW drivers enjoy competition, see life from a critical perspective and are both self-motivated and self-confident. As a special breed distinguished by their individualism, it is not surprising that their car is a BMW. At least in this relationship of man and machine, it is obvious that each is made for the other. A most personal statement of style — the exclusive BMW L7. Outstandingly singular in its execution of hand crafted elegance and performance technology, the BMW L7 represents a new standard of luxury BMWs. As the first and most elegant of the new BMW L Series, the L7 stands as the definitive statement of personal accommodation. 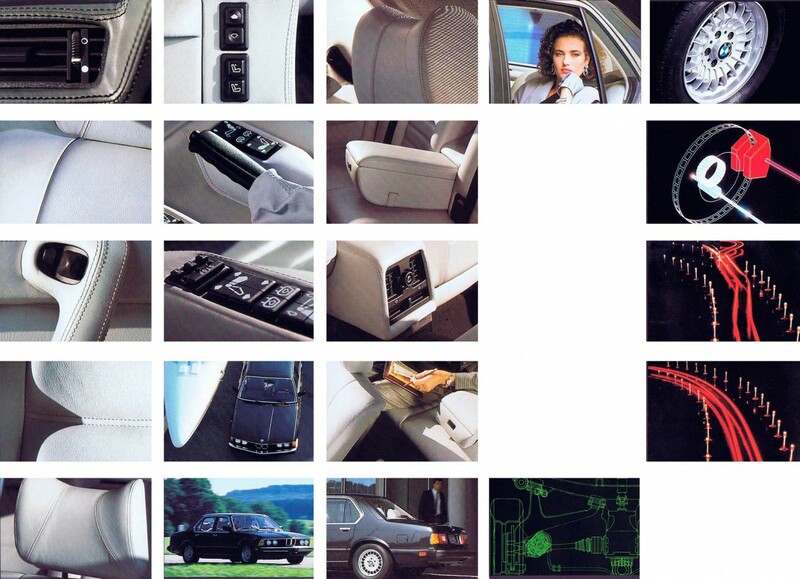 Each distinctive feature reflects BMW’s success in achieving a redefinition of luxury. In a striking symbiosis unique to the L7, the technical elegance and taste of a handcrafted interior are achieved in a world class performance sedan. Truly distinctive in its level of refinement — truly unique in its blend of elegance and performance. 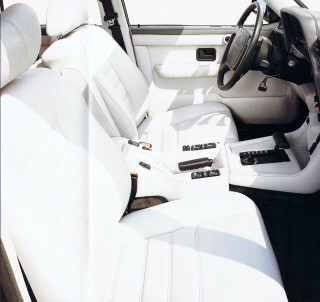 From the hand-stitched interior of supple silver hides with the Supplementary Restraint System to the individualized performance afforded by the EH electronic transmission, the L7 leaves no doubt as to its stature. It is a contemporary classic. BMW no longer stands alone in speaking of performance as the soul of a true world-class high-line sedan. Quality is the sum total of doing all things well. As of late, many manufacturers have taken the BMW philosophy as their own. However, it only takes a ride in one of their “performance” sedans to affirm that building a BMW takes more than a marketing decision — it takes BMW’s decades of dedication to excellence, exhaustive research and race experience. Under the hood of the BMW L7 is the same basic 6-cylinder engine which, in several variants, has powered BMW race cars to numerous victories in international road racing over the last decade. It employs the classic in-line 6-cylinder design noted for its velvet-smooth running characteristics. 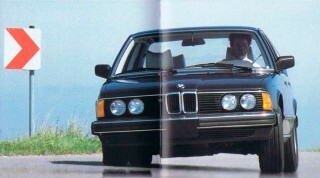 BMW then enhanced the basic design with the application of innovative solutions employing the most advanced technology. Bosch L-Jetronic fuel-injection determines the precise amount of fuel to be injected. Hemispherical, swirl-action combustion chambers mix the fuel/air mixture, concentrating it around the spark plugs in a remarkably complete manner. 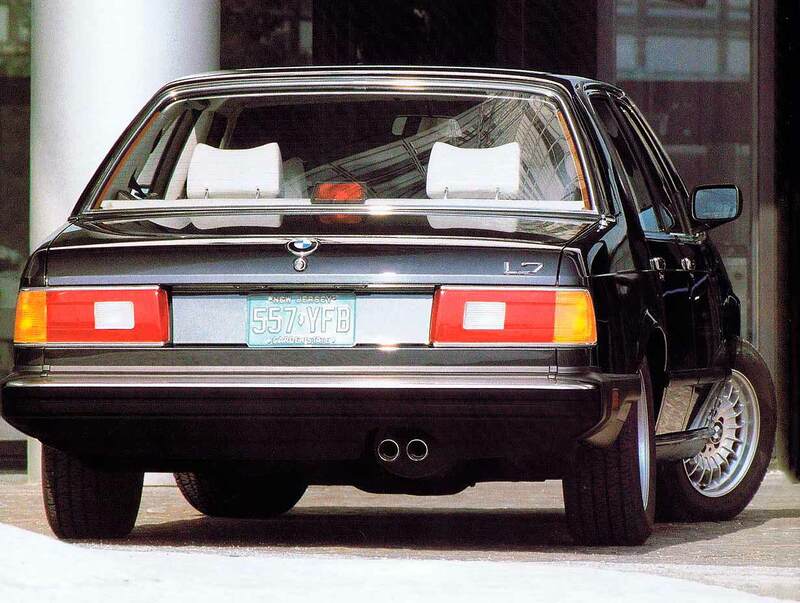 So well is this combustion process accomplished that the power plant of the BMW L7 — small when compared to the V8 behemoths still found in many conventional luxury sedans — produces prodigious horsepower despite its modest displacement. Seven main bearings with 12 crankshaft counterbalance weights — unusual refinements in a luxury sedan — give the whole operation a turbinelike smoothness that is distinctively BMW. All this, in conjunction with the new BMW Digital Motor Electronics, helps create a car truly capable of meeting today’s demands for fuel efficiency and cleanliness without ever violating the BMW concept that extraordinary performance is the only thing that makes an expensive car worth the money. An interior that welcomes you with supple silver elegance. The objective of a BMW’s interior design is to provide perfect all-around visibility, optimum control of the L7’s advanced systems, and safe and reliable response to driving conditions. The L7’s elegant interior maintains the occupants’ level of comfort, even over extended periods of driving, and of course, accomplishes it in a motoring environment offering every conceivable amenity. With the rich texture and comfort of natural hides, BMW’s L7 all-leather front seats offer a firm yet accommodating design that reflects their orthopedically-inspired shape and construction. Not only do BMW bucket seats afford excellent spinal support for long trip comfort, they provide exceptional lateral support for control in hard cornering. A totally engineered performance automobile does not stop with a state-of- the-art suspension design for good handling — it provides for driver stability as well. Fully reclining the L7 front seats have power seat controls with memory and hand-stitched leather arm rests. Now, not only can the front seats be electronically adjusted in angle and height, but should another driver change the settings, the memory feature will return to the original settings with the push of a button. Trimmed in beautifully-finished king- wood, the dashboard and hand- stitched leather center console exhibit a handsome display of ergonomically designed and positioned instruments and controls. Power windows, power two-position sunroof, driver’s side airbag, cruise control, power-heated outside mirrors, heated driver’s side door lock, 2-speed and intermittent wiper/ washer and central power locking begin the list of luxury features standard in this interior. And it is an interior full of sensory rewards — materials rich in tone and texture create an environment that welcomes the passenger with quality leather, full carpeting and real wood trim. Air conditioning and heating controls afford an exceptional range and power in the selection of temperature. As well, the air flow design provides for a thorough and even distribution throughout the passenger compartment. BMW offers the driving enthusiast a cockpit with “intelligent” technologies that take over many routine chores. Perhaps the most outstanding of these systems are the active Check/Control, the Service Interval Indicator, the EC Energy Control and the On-Board Computer II. The automatic wav to extra safety: Active Check/Controt. The Check/Control keeps the driver informed of the operational readiness of his car. Simply by depressing a button before starting the car (when the ignition is turned on), information can be obtained on certain vital functions of the automobile — and instantly warn the driver of problems. The first known example of a car evaluating its driver. Another unique BMW feature is the Service Interval Indicator — a computer-driven system addressing the previously unconsidered fact that different people drive differently. With the aid of electronic sensors located around the car, the indicator monitors individual variations in driving habits — as measured by factors such as engine speed and temperature and the frequency distribution of weekly driving time — along with the distance driven. Exact fuel consumption information, not just averages. Unlike other indicators, Energy Control fuel consumption indicator is engineered for precision rather than approximation. With a remarkable degree of sophistication and accuracy, it provides the driver with an excellent indication of how much fuel the car is consuming at a given moment. The BMW On-Board Computer and allows the driver to concentrate on more important matters — such as driving. The nine-function On-Board Computer II displays such information as time and date, outside temperature (warning when outside conditions may be freezing), computed fuel mileage with the driving range left on the remaining fuel, a stop watch function and an incorporated anti-theft device. A radio not worth stealing but well worth owning. The BMW anti-theft radio. 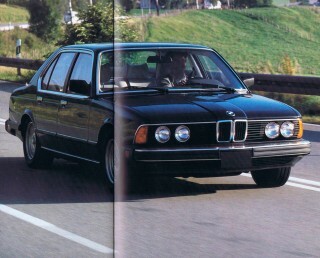 BMW’s AM/FM ETR stereo cassette anti-theft radio is designed to be unusable unless in the car of its rightful owner. With this new design the radio, if disconnected, will not operate when reconnected until a five-digit security code assigned to that radio is entered. BMW’s L7 Standard Supplementary Restraint System. The Supplementary Restraint System combines the three-point seatbelt and an airbag system. While the safety belt is certainly a proven and indispensable feature contributing to safe driving, the airbag is designed to provide additional protection to the driver. 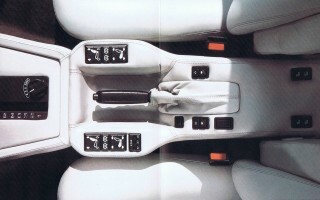 An interior elegant in the tradition or old world craftsmanship in an automobile built on the technology of tomorrow. 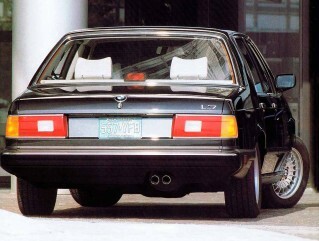 The craftsmen of BMW approached the challenge of creating the L7 with great pride. Creation of an automobile worthy of the L7 design objective would establish the definitive BMW statement of technical elegance and ultimate luxury. 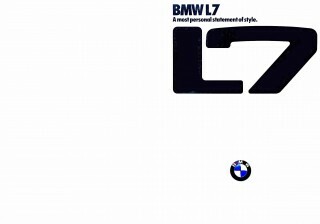 To experience the L7 is to know the supreme success with which the prideful craftsmen of BMW achieved their goal. At BMW, the cockpit receives as much attention as the chassis and drive- train: to do otherwise would ignore the most vital performance component — the L7 driver. BMW has integrated all cockpit controls and instruments into an optimized expression of ergonomic principles. The driver’s line of vision, seat, steering wheel, gear-shift lever, controls and instruments are placed exactly where they should be to optimize communication between the driver, the automobile and the surroundings. The cockpit of the BMW L7, thanks to extensive ergonomic testing and research, conveys a feeling of total yet effortless control. The main instruments are integrated in a cluster directly in the driver’s line of vision. All gauges are marked clearly and, at night, illuminated by an optically- beneficial orange light. The instrument panel, constructed in a concave manner, curves towards the driver. Thus, regardless of the position of the driver or the driver’s arm length, all controls can be reached comfortably, quickly and safely. At BMW, the goal is the perfect integration of man and machine. This explains why, when you take the wheel of a BMW for the first time, you’re not just sitting in a BMW; you’re connected to it. Custom stitching is evident throughout the L7. Seats, center console, front arm rests — their silver natural hides form a masterpiece of meticulous workmanship. To ensure the fullest degree of comfort, the orthopedically-designed fine leather seats feature finger-tip control for effortless adjustment. The memory feature eliminates the inconvenience of readjusment when there is more than one driver. The BMW L7 employs a heating and air conditioning system with individual control vents for both front and rear occupants (5). Heated outside rear-view mirrors are adjustable from the driver’s side (7). Headrests, electrically adjustable in both angle and height, accommodate each driver’s requirements (9). Front seats offer not only fully adjustable electronic-controlled seating but a memory function as well. With the push of a button the seats will return to a pre-programmed setting (3,5,6). BMW's new ZF electronic transmission-the automatic transmission that lets you select the type of driving you want. At a time when automotive system designs have been scrutinized in search of increased efficiencies, the transmission has largely been left to function in a most traditional fashion — until now. BMW, in seeking to increase efficiency and optimize performance, focused its capability for innovation on the traditional transmission. The result has been, as should be expected, a most untraditional and inspired solution. BMW’s expertise in automotive electronics created the EH electronic transmission which integrates transmission and engine functions to offer peak economy and total performance capabilities with the same transmission. The sophistication of the system is evident in the integration of the transmission control into the DME (Digital Motor Electronics) computer. A key feature of the EH electronic transmission is its ability to offer a variety of shifting modes. A position selector on the console offers three shifting modes. The “E” or economy position programs the points at which the transmission shifts for maximum fuel economy. The “S” or sport position upshifts come at higher road speeds with the fourth gear, overdrive, excluded. 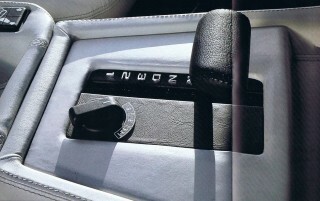 The “3-2-1 ” position gives full manual selection of first, second, and third gears via the normal selector. The driver using an EH electronic transmission benefits from the stand point of performance, efficiency and safety. By the integration of engine functions into the EH electronic control system, shift points are far smoother than with traditional transmissions, regardless of what shift mode is selected. With the safety overrides, the dangers of costly repairs due to overrevving are greatly reduced. A warranty engineered to perform like a BMW. A car so meticulously crafted deserves to be meticulously maintained. Of course, a car built with such attentiveness to detail and quality deserves to be accompanied by a warranty of equal caliber. Every new BMW is protected by a warranty that represents one of the finest owner protection packages — three-year/36,000-mile limited warranty covers defects in materials and workmanship with a six-year limited warranty against rust perforation. An authorized BMW dealership reflects an intense level of pride in the BMW product and a total commitment to serving the needs of the BMW owner, including BMW CC financing or leasing programs. BMW service technicians undergo rigorous training to maintain their level of proficiency by attending annual updates and taking advantage of a broad offering of technical courses available at BMW training centers. Quality of repair is a function not only of technician skill but quality of replacement parts as well. Genuine BMW replacement parts guarantee that a BMW once repaired remains faithful to the BMW commitment to driving excellence. It is true that to do a job well requires having the right tools. BMW technicians, in addition to having the skills and genuine BMW replacement parts, have tools specifically designed for BMWs and available only through authorized dealers. BMW service and BMW parts are available at more than 400 authorized dealers coast to coast in the United States — and in more than 100 countries around the world. The L7 rear seats benefit from an orthopedically-inspired design and offer a center fold-down arm rest. Rear knee room is exceptional, thanks to the special contour of the rear seat back rest. The rear seat bench has been modified in accordance with the highest ergonomic standards in order to provide optimum spring action and suitable distribution of pressure over the entire seat area. 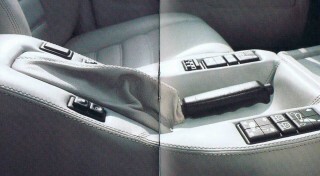 Three- point seat belts are provided for the outboard positions with a lap belt in the center position. The L7 trunk offers 13.4 cubic feet of fully carpeted and lighted trunk space. A deluxe tool kit is standard as well. A back seat so accommodating you might actually let someone else drive. BMW understands that the beauty of a high performance sedan does not stop at the skin. No BMW rests on the excellence of a single component; rather a BMW’s excellence is defined by a balanced integration of all its components. This is the BMW concept of total performance. Thus, the 3.5-liter six powers a chassis that is singularly extraordinary in its execution of the sum demands of the driving experience. Whether endless interstate, snaking back roads or something in between, the L7 suspension exhibits an extraordinary road-holding capacity. 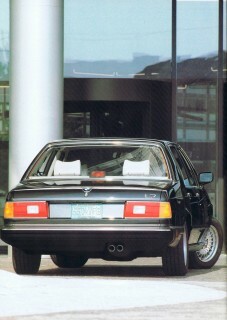 With BMW’s unique double-pivot Mac-Pherson strut front and semi-trailing arm rear design, the L7 4-wheel in-dependent suspension offers what is widely accepted as one of the most responsive suspension designs. Tailored to match the new suspension geometry, the BMW’s 4-wheel disc ABS brake system is perfectly designed to enhance the automobile’s performance and benefit from the superior chassis. The most important feature of ABS is that, while applying maximum braking, the driver can still steer the automobile to avoid obstacles or change direction. ABS also stops the car from swerving on road surfaces with varying surface conditions; for example, when the righthand wheels are running on the soft shoulder of the road or the surface is not quite dry. In addition to the increased stopping surety of the 4-wheel disc ABS system, BMW’s diagonal-twin circuit brake design ensures that should one brake circuit fail to operate, one front wheel and the diagonally-op- posed rear wheel will still have their full braking power. The crucial link point between the performance automobile and the road is each tire. Available are 205/ 70 VR 14 high performance tires on forged light-alloy rims. The L7 is available with the new EH electronic 4-speed ZF automatic transmission with electronic control. The EH electronic transmission can increase fuel efficiency up to 10 percent. A 5-speed manual transmission is available at no extra cost. ABS anti-lock braking represents a revolutionary advancement. The driver benefits from a vehicle that stops more surely and can be steered under maximum braking. The ABS system consists of a speed sensor for each wheel and an electronic brain to process the speed data. Interacting with the associated hydraulic unit the “brain” can then control the braking force acting on each wheel (4,5,6). A unique MacPherson strut front suspension and semi-trailing arm rear suspension deliver exceptional road-holding and stability (3). Perfected on racecourses like the Niirburgring, where precision is crucial and agility and durability are more than just matters of theoretical speculation, its suspension is fully independent on all four wheels. Four-door sedan, rigid steel safety cell passenger compartment, crush zones front and rear. Length 197.4"; width 70.9" height (unloaded) 56.3". Wheelbase 110.0"; track front 59.1"; rear 60.0". Turning circle 38.1 ft. Door cutouts front 39.8"; rear 34.8". Bucket seat width 21.3"; rear bench seat 57.7". Width at elbow height front 59.4", rear 59.4". Trunk capacity approx. 17.0 cu.ft. Fuel capacity approx. 22.5 U.S. gal. including 2.1 gal. reserve. GAWR front 2230 lbs. Rear 2470 lbs. M30 Six-cylinder (big-six) four-stroke in-line watercooled engine longitudi-nally mounted and inclined, light alloy cylinder head with crossflow design, hemispherical swirl-action combustion chambers, overhead camshaft with 4 bearings, inclined over-head valves in V-arrangement, roller chain drive, vibration- dampened crankshaft with 7 main bearings and 12 counter-balance weights, pressure oil circulation, full-flow oil filter with regulation valve, viscous speed-related fan drive with thermostat control circuit. Bosch L-Jetronic fuel injection, 3-way catalyst with Lambda sensor, Digital Motor Electronics (Motronic). Breakerless ignition system controlled by DME. Three-phase alternator — 80 amp, 1120 watt. Battery 12 volt, 66 amp hrs. Hydraulically-actuated, single-plate dry clutch, torsional dampers and automatic adjustment. Optional 4-speed ZF electronic control automatic transmission. Cruise control is standard. Two-piece drive shaft with flexibly mounted central bearing and 2 universal joints; rear-wheel drive through double universal joint shafts with maintenance-free constant velocity joints. Acceleration: 0-50 mph in 6.0 seconds, manual trans-mission. Unleaded gasoline: 91 RON (87 AKI). Front-wheel suspension: independent with double-pivot strut, virtual steer axis with small positive kingpin offset, eccentrically-mounted coil springs to reduce binding under load, roll stabilizer, urethane bump rubbers. Rear-wheel suspension: independent semi-trailing arms with patented track change link, telescoping struts, coil springs. Collapsible safety steering column with axial adjustment of steering wheel, hydraulic speed-related, power-assisted steering system, 3-part track rod, overall ratio 17.6:1. BMW-style light alloy rims: 6 1/2J x 14. Steel-belted radial tires: 205/70 VR 14. Dual-diagonal circuit-power braking system with hydraulic booster and rear axle brake pressure regulating device. Anti-lock braking system with dash-mounted warning light. Front: ventilated single-piston floating-caliper disc brakes with automatic adjustment, diameter 11.0"
Rear: floating caliper disc brakes with automatic adjustment, diameter 11.0"
Mechanically-operated handbrake, diameter 7.8" with self-servo shoes acting on rear wheels. Exterior: energy-absorbing 5-mph bumpers with rubber moldings mounted on hydraulic shock absorbers. Protective wrap-around bumpers, rubber strips along sides of body. Quad headlights with halogen beams and ignition override, foglights, backup lights, high- mounted third brake light. Tinted glass all around, dark green border on top of wind-shield. Dual electrically-adjustable outside rearview mirrors with warning on convex glass; heated outside mirrors and driver’s door lock. Central locking system on all doors, gas filler flap and trunk lid. Electric dual- position sunroof, twin chrome-plated exhaust pipe tips, cavity seal, undercoating. Heating and Ventilation: air conditioning with recirculating feature. Fresh air heating system with airflow output control using rotary knobs (push-button direction control), 4-stage blower. Defroster for windshield, side and rear windows. Air distribution at floor level and five dashboard grills; adjustable grills for each front seat occupant; additional outlets for rear-seat passengers with 2 separately controlled grills on top of central tunnel; illuminated heated controls, flowthrough ventilation. 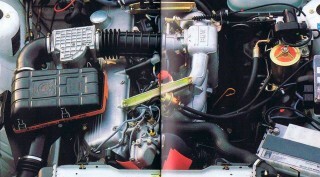 Interior: easily readable and clearly mounted instruments with infinitely adjustable orange illumination arranged in a semi-circle around the driver. Electronic speedometer with odometer and trip recorder; electronic tachometer, fuel and temperature gauges; fuel economy indicator and digital clock. Service Interval Indicator. Warning lights for fuel reserve, handbrake, brake fluid, brake lining wear, alternator, oil pressure, “Fasten Seat Belts,” Oxygen Sensor Service. Active Check/Control to monitor brake lights, low beam, windshield washer fluid level, oil and coolant levels, tail- lights, license plate illumination. On-Board Computer for trip information, range, anti-theft protection. Stalk control for automatic windshield wiper/washer with single-wipe, intermittent and 2-speed operation. Power-controlled windows. AM/FM stereo cassette anti-theft radio with automatic rear- mounted antenna. Front: four-spoke leather covered telescoping steering wheel with airbag and 4 horn contacts. Reclining deep leather seats with added back support and adjustable headrests. Each has electrically-adjustable height and inclination with memory, easy longitudinal adjustment on roller bearings, heated driver’s seat. 3-point automatic seat belts, hand grips for passenger, center front armrest. Rear: contoured leather seats with headrests and fold-down center armrest, 3-point automatic seat belts, 2-point seat belt in center. Map reading lamp, roll-up rear window sunshade. 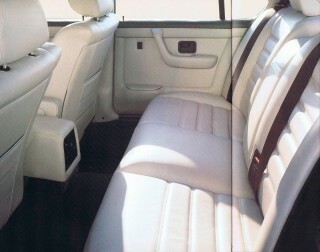 Fully carpeted interior, rear shelf; illuminated lockable glove compartment. Additional storage in front door pockets, center console and armrest. Illuminated ashtray on dashboard and each rear door; anti-glare rearview mirror. Doorlocks with safety wedges, childproof safety locks on rear doors. Interior lights with contacts on all doors, dash-mounted switch; illuminated front passenger mirror and time delay courtesy light. Engine and trunk lights, fully carpeted trunk in grey tufted fleece; deluxe tool kit in trunk lid. Four-speed ZF (ZF 4HP) electronic control automatic transmission with sport and economy settings, limited slip differential, TRX wheels and tires. BMW reserves the right to make changes in specifications, standard and optional equipment without prior notice. Further information can be obtained from your BMW dealer.